Proper pullups and series resistors protected against the inevitable EMI and spike interference in a factory environment, the inputs were then buffered by an octal buffer (also featuring hysterisys) and displayed on LEDs as well as being put to the microprocessor pins. 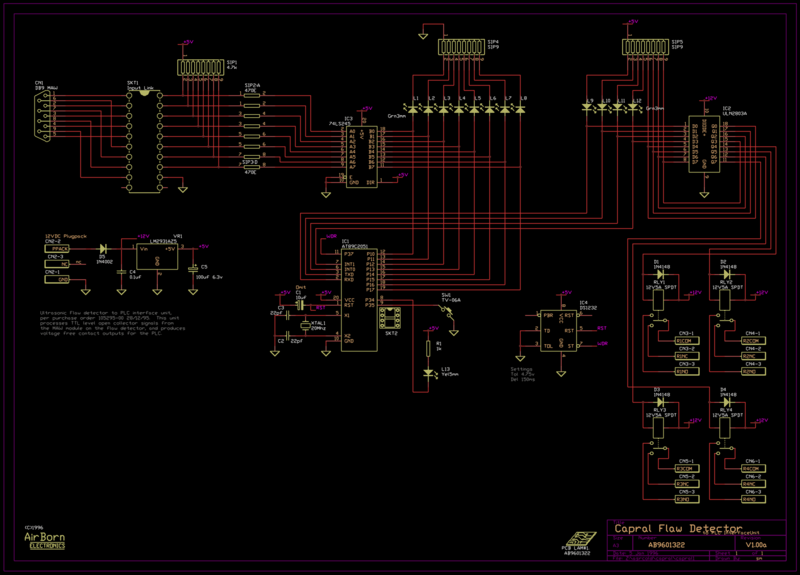 Reviewing the circuit today, I would consider changing the 74LS245 (IC3 )to another device. They were much more readily available a few years ago. I would suggest a 74HC245 would be more suitable, and if that device were chosen I would increase SIP2 and SIP3 to a value of 10k. That gives more input protection. The 245 was used as it offered hysterisys for the inputs. While it is a bidirectional device, it is wired in single direction mode. All microprocessors have a tendency to "click" the relays when they are reset - and this normally causes real problems for whatever you are trying to control. It normally shows up as all four relays clicking on briefly as the power is turned on (or off) to the device. In the circuit that you are looking at you will see that the UNL2803 (IC2) is wired up to invert each relay drive signal twice before applying to the relay. The 89C2051 resets with all its pins in the "high" or idle state. With the two inversions you need to drive the 89C2051 pins low to activate each relay - but also, you do not get any "clicks" on the relay when you turn the power on and off. The DS1232 (IC4) is a watchdog reset chip - the software needs to drive a continuous stream of pulses out of the WDR pin (P3.7 on the microprocessor) in order to have normal operation. When the software malfunctions, the pulses stop, and the watchdog resets the software to resume correct operation. For an excellent resource on watchdog timers please refer to 'Building a great watchdog' by Jack Ganssle. The reset time from a DS1232 is about 0.5 seconds or so and is very noticeable on the relays if they are not wired up correctly. The watchdog reset is a very very useful addition to industrial type equipment, it makes the electronics significantly more reliable. The DS1232 also monitors power supply levels. This PCB, designed in 1996, was installed in a factory environment and so was fitted with a proper watchdog externally to minimise problems. The inputs were taken through a link block in a DIP socket, so that any problems in pinout of the DB9 could be rectified without modification of the PCB. The microprocessor monitored the fast input pulses and operated the four relays appropriately. The relays also had LEDs on the outputs. As mentioned previously, SKT1 is a link block that allows reprogramming of CN1 pinout. 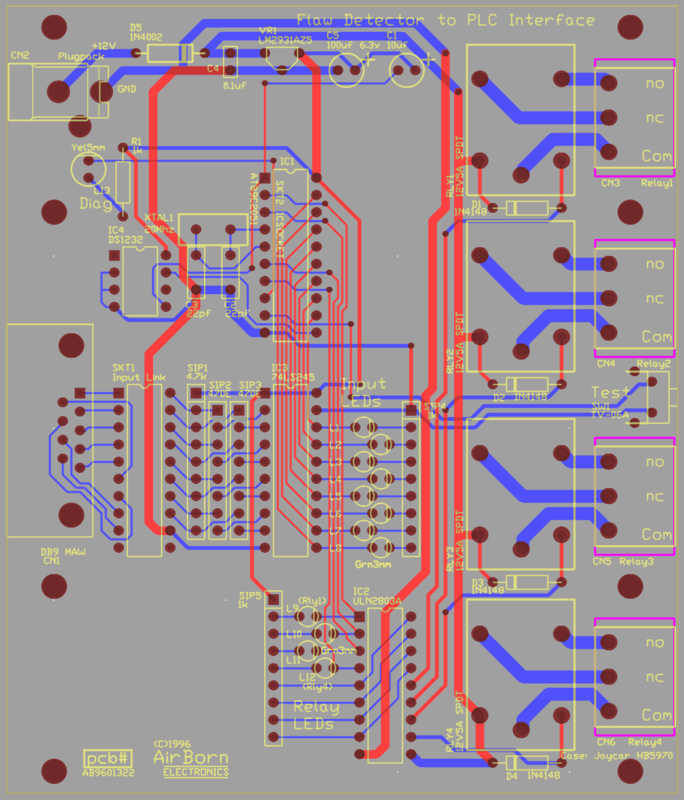 This board was made in small quantity and we wanted to be sure of getting the pinout right without having to remanufacture. 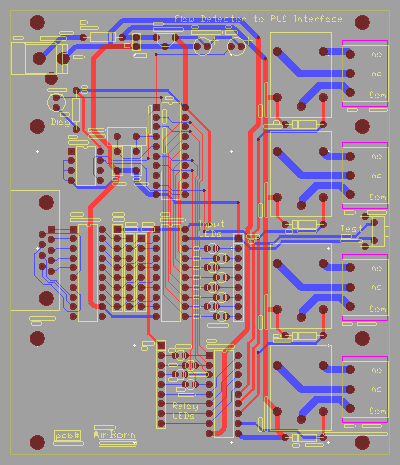 The solution was to wire up SKT1 with all wires going across the device (pin 1 to 20, 2 to 19 etc) and then to remake SKT1 if the pinout was not correct. 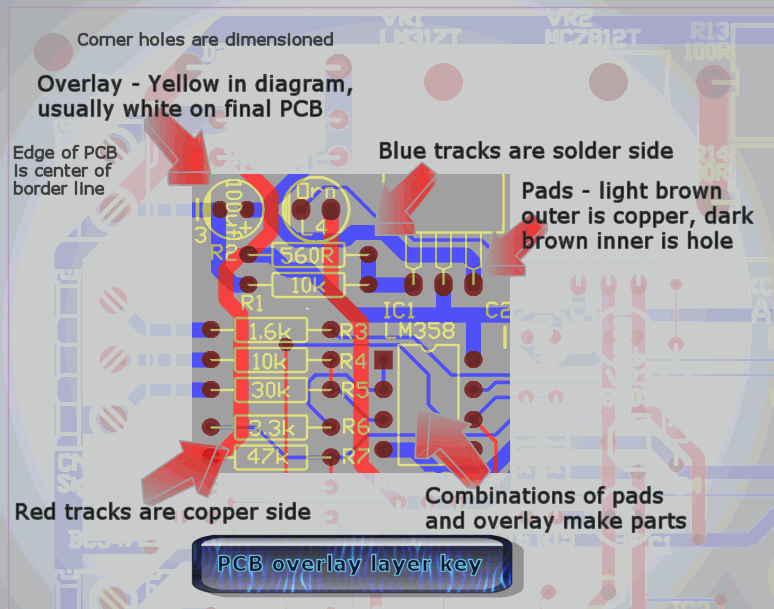 The layout for the PCB was designed with 8 mounting holes to fit a standard plastic enclosure that could then be mounted in the steel equipment cabinet. The relays are a standard Omron pinout that has been used by many other manufacturers. The relay outputs each go to seperate unpluggable wiring blocks. The whole project was quite successful except that it was sold through an unethical consulting firm: KKS instruments here in Sydney Australia. This firm had us produce a second much more complicated and difficult board. We were straight with the consultant as we began the project - the job is hard, but we will do it. We successfully made the board, but on install into the ultrasonic tester the tester itself failed - a simple power supply failure, but made worse because the +/- 15V power supply was not even short circuit protected. Expensive equipment, poorly designed. KKS instruments then did not pay for any of the design work, despite our work being flawless. They blamed us for their own shoddy equipment!